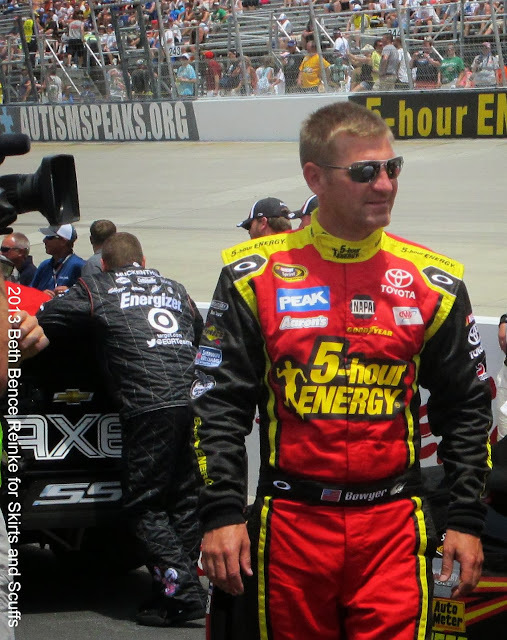 5-Hour ENERGY will remain Clint Bowyer's sponsor in 2014. After NAPA Auto Parts' decision last week to sever ties with Michael Waltrip Racing in the wake of the organization's efforts to alter the outcome of the Richmond race, all eyes turned to 5-Hour ENERGY to see if the primary sponsor of Clint Bowyer's No. 15 Toyota would follow suit. 5-Hour ENERGY is staying on board. The energy drink company released a statement Friday announcing it will return as a sponsor with Bowyer and MWR in 2014. Company officials had said they would make a decision at the end of the season, but they decided to move up the timetable, meeting after Sunday's Sylvania 300 at New Hampshire. "This week the 5-hour ENERGY team met after the New Hampshire race to discuss our future with Michael Waltrip Racing. While our original plan was to announce the status of our sponsorship at the end of the year, this timeframe left many concerned about their future. There are scores of passionate fans, numerous charitable organizations, and hundreds of hard-working MWR employees and their families who are directly impacted by 5-hour ENERGY’s NASCAR sponsorship. After several internal discussions and meetings with MWR, we are prepared to announce our decision ahead of schedule. 5-hour ENERGY will be back as a sponsor of MWR and Clint Bowyer for 2014. We look forward to another great year of competitive racing. Go 15!" Longtime sponsor NAPA announced Sept. 19 it would cut ties with MWR after NASCAR penalized the organization for manipulating the outcome of the Sept. 7 Richmond race to aid its driver, Martin Truex Jr., in making the Chase. As a result of the penalties, the NAPA-sponsored Truex was booted from the 10-race playoffs. With seven laps to go at Richmond, Truex's teammate Bowyer spun and brought out a caution, a move that appeared intentional. Bowyer, sponsored by 5-Hour ENERGY, was not penalized for the spin, but was penalized along with teammate Brian Vickers for pitting late in a move to help Joey Logano gain position on the track, allowing Logano to make the top 10 in points and enabling Truex to claim a wild card Chase berth. 5-Hour ENERGY is the second major sponsor of Michael Waltrip Racing to stay with the organization after the Richmond scandal. On the same day NAPA made its decision to cut ties, Aaron's announced it will continue its longstanding relationship with MWR. "Aaron’s would like to thank NASCAR fans for their continued loyalty during this time of uncertainty. We became a sponsor of MWR 14 years ago and remain dedicated to MWR, to NASCAR and to the fans." We offer some of the most excellent services at the most reasonable cost in motorsports. racing sponsorship Weatherman Motorsports is a world-class grassroots motorsports marketing and racing car sponsorship program to fit your budget and needs promotion motorsportsracing sponsorship, motorsports marketing, sponsorship for race cars, ARCA Racing, racing sponsorship, car speedway, speedway schedule, vegas speedhgh, race car sponsor, motorsports marketing and racing car on Motorsports Promotion to spread to word about his racing activities. Become a member of today! Thank you for division such a helpful post.